The BOUND Book Arts Fair will celebrate its first anniversary on Sunday, December 9th 2018 from 11am to 5pm, at the Arts & Letters Club, 14 Elm Street (near Yonge & Dundas) in Toronto. The fair will be bigger than the inaugural one last year because there will be a second room available at the Club, providing space for 26 vendors in all. We’ll have a table at this fair, selling handmade paper, marbling, and a small selection of bookbinding supplies. 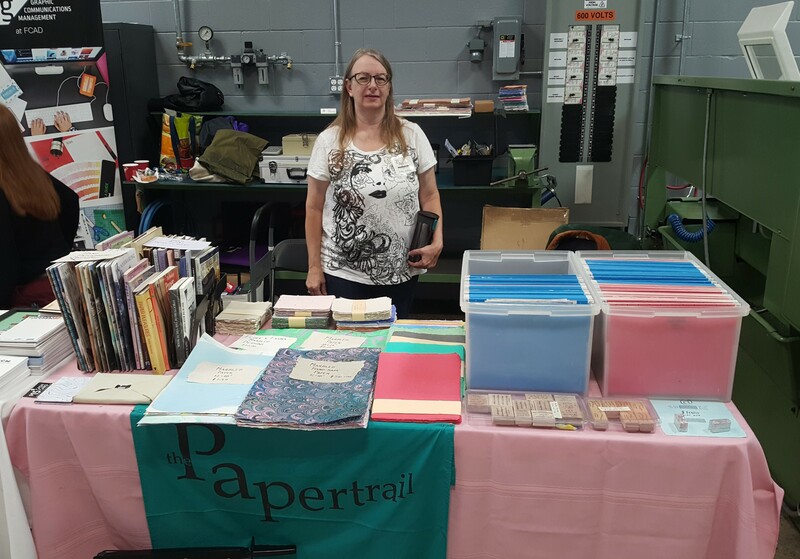 Last Saturday was the inaugural Howard Iron Works Print Expo & Fair, where we had a table selling our paper and second-hand books on topics relating to the book arts. The show was hosted by Howard Iron Works, a restorer and museum of old printing equipment affiliated with Howard Graphics. The tables for the fair were set up in the workshop, which had just undergone two days of cleaning and was spotless. I guess we aren’t the only people who are motivated to clean by the threat of company coming! Setup time in the workshop before the fair. 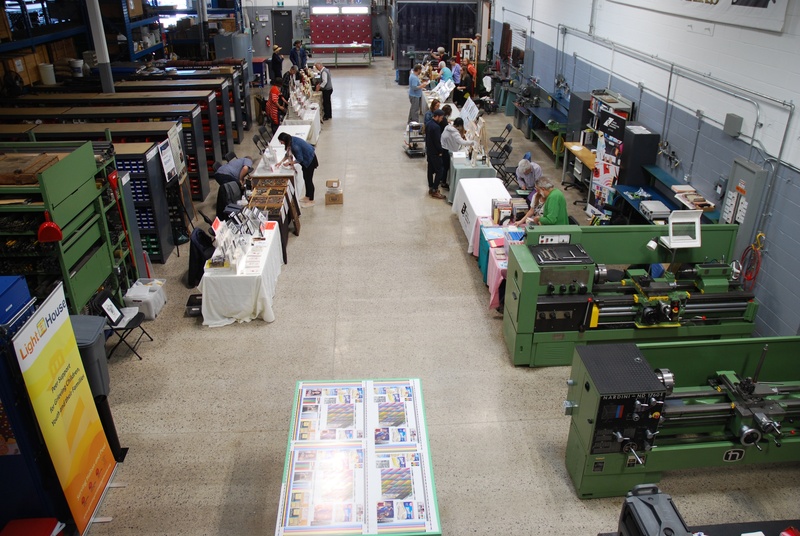 Our table is the first on the right, just behind the green lathe. Photo by Liana Howard. Sunday August 26th was the wrap-up day for the conference. In the afternoon there was a barbecue and open house hosted by Patrick Reagh Printers in Sebastopol, about an hour’s drive north of San Francisco. Unfortunately my flight home departed early in the afternoon, so I had to pass on this event. I spent the morning talking with various other attendees who were waiting in the hotel lobby for their respective rides, either a shared car to the barbecue or the hotel’s airport shuttle. There were originally plans for a shuttle van or bus to the BBQ but I think too many people had too many different departure times for this to be practical. Packing was a bit tricky, since I had a package of type and a Monotype mould in its case, and also a stack of paper keepsakes to put in my suitcase. Fortunately the dirty laundry provided padding to separate these, and the only real casualty was the ATF “constitution” poster, which got a bit crumpled at the edges. The first day proper of the 2018 ATF conference consisted of a series of presentations given in the gallery space at Arion Press. The day started off with a continental breakfast, a Welcome and general comments and announcements, then on to the first presentation. A new book arts fair has popped up in the Toronto area: the Howard Iron Works Print Expo & Fair on Saturday, September 29th 2018, from 10am to 4pm. 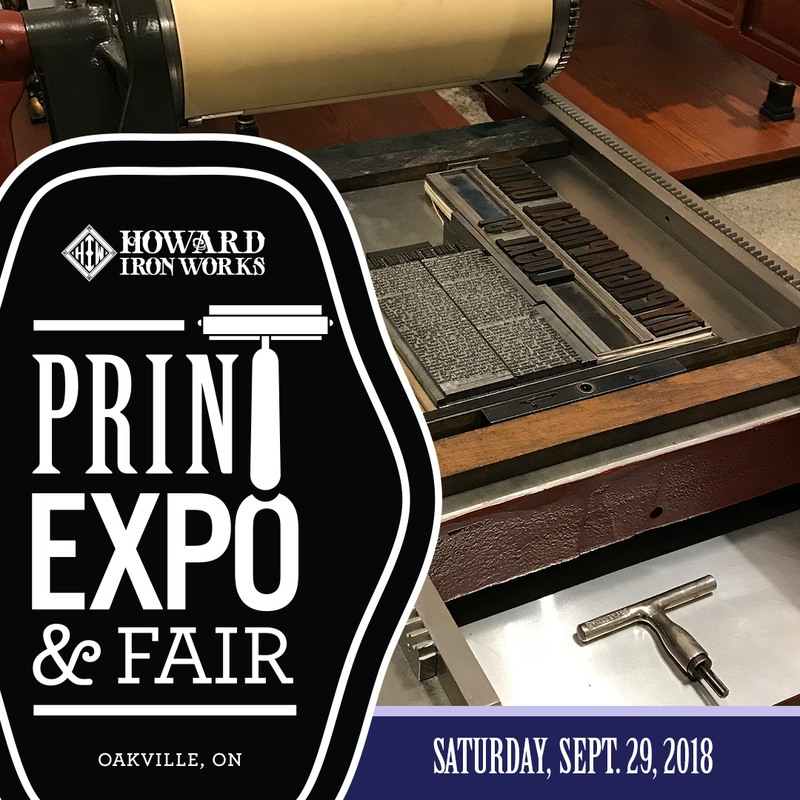 This will take place at Howard Iron Works, 800 Westgate Road, Oakville Ontario, where they have (so I’ve heard) a wonderful museum of restored old printing presses as a backdrop to the fair. I’ve been meaning to visit this museum for several years but never seem to get around to it. This event is being held in conjunction with the local Doors Open event, which is a sort of organized simultaneous open house of multiple local buildings and businesses. For the fair, the museum will have a press or two running, and perhaps their Linotype, and some of the 14 exhibitors will be doing demonstrations as well. We’ll have a table there, selling paper, marbling, and some bookbinding supplies. We don’t do Facebook ourselves, but the museum has a page there for this event. About 2½ years ago we changed our dryer felt because we couldn’t obtain the previous product. Our last roll of this wide thick stuff has run out, but we’ve managed to find a supplier of dryer felt that is more like what we sold pre-2015, both in terms of thickness and also roll width (60″/152cm). The price for this felt is also changing back to its pre-2015 price of $6.00 per metre. Why “Day Zero”? The American Typefounding Fellowship conference proper started on Friday, August 24th, but the day before that had technical sessions, where we got to see how M&H Type run their Monotype Composition casters. I attended the afternoon session, not so much to learn how to run a caster, but to see the special quirks that every foundry seems to have on how they run their casters. As an aside, there was also a “Day -1” which consisted of an evening hospitality suite at our hotel. On my return flight from the ATF conference in San Francisco I spotted two interesting views out of my airplane window (facing South). The Killpecker Sand Dunes are formed from an old riverbed which provides a source of sand, with the prevailing westerly winds blowing this sand though a gap in the mountains across the plain. The blown sand forms this long cigar-shaped dark area with patchy dunes in it. I expect that the dark shape is from the sand wearing away lighter-coloured surface materials. This erosion probably forms a bit of a depressed area which keeps the sand confined despite minor variations in the wind direction. The other interesting sight was a thunderstorm near the Wisconsin/Illinois border, west of Beloit. This was just after dusk so the lightning flashes were easily seen, though the bolts themselves were mostly hidden within the cloud. Although it was not a huge storm, the view was excellent so I took a short movie of in using my cell phone. 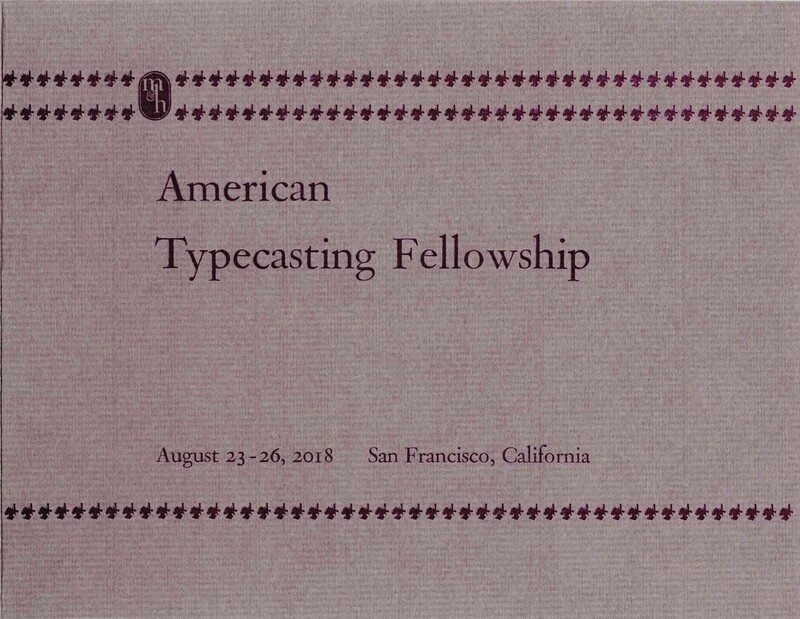 Tomorrow I’ll be flying to San Francisco for the 2018 American Typecasting Fellowship (ATF) conference, hosted this year by M&H Type and the Arion Press. I expect most of the usual gang to be there, with presentations about old systems for casting type for letterpress and stories (both horror and successful) about keeping the old craft alive in the modern age. There will probably be some ATF people based on the West coast whom I haven’t met before as well. Previous ATF conferences I’ve attended have been in Auburn NY (2016), Salem NH (2014), Portland OR (2012), Piqua OH (2010), and Grafton IL (2008). I hope to have a report in this blog of some of the activities in a more timely manner than in 2016!